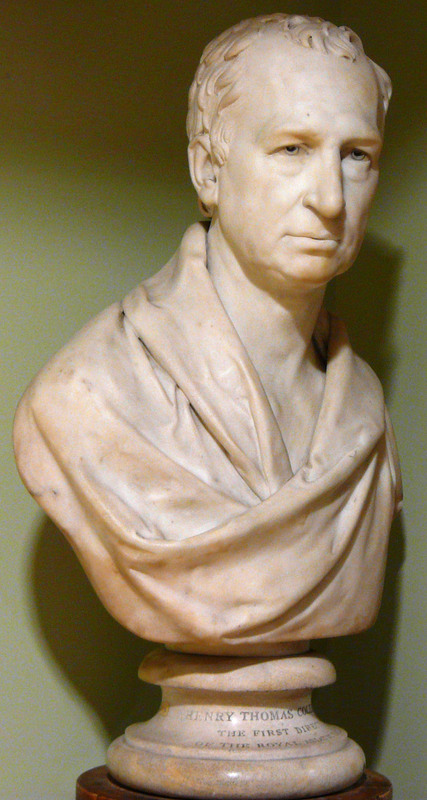 Henry Thomas Colebrooke FRS FRSE (1765-1837) was a Sanskrit scholar and orientalist. He was born in London, the third son of Sir George Colebrooke, 2nd Baronet, Chairman of the East India Company, and Mary Gaynor of Antigua. He was educated at home and at fifteen was adept in classics and mathematics. In 1782 Colebrooke was appointed to a writership in India. He held administrative, legal and academic posts whilst in India during which time he learnt Sanskrit. He was thus able to translate “Digest of Hindu Laws”, unfinished by Sir William Jones. He translated the two treatises, the Mitacshara of Vijnaneshwara and the Dayabhaga of Jimutavahana under the title Law of Inheritance. During his residence at Calcutta he wrote his Sanskrit Grammar (1805), some papers on the religious ceremonies of the Hindus, and his Essay on the Vedas (1805). Colebrooke returned to England in 1814 where he played an active role in promoting knowledge. He was co-founder of the Royal Astronomical Society. More significantly for the Royal Asiatic Society, he instigated its foundation, with the initial planning meetings taking place at his home. He presided as Director of the Society until his death in 1837. 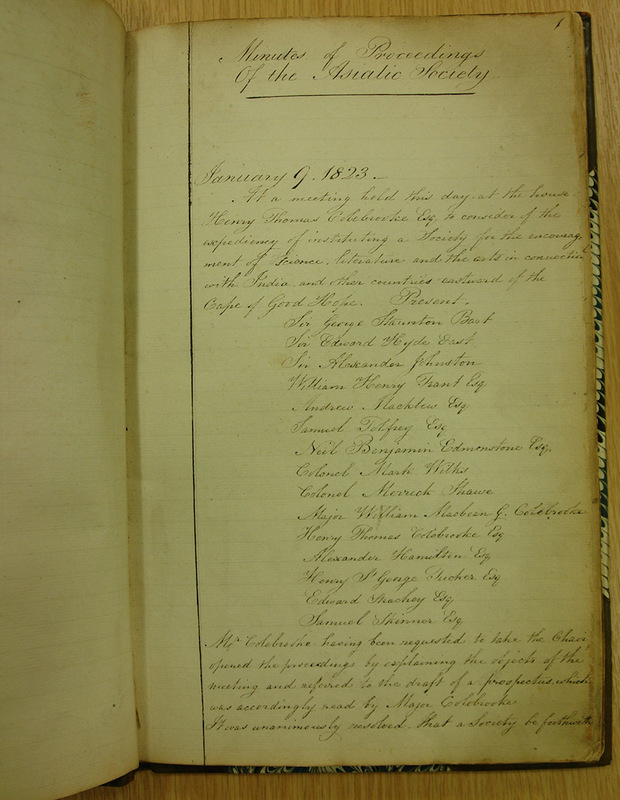 The Collections of the Royal Asiatic Society contain correspondence and papers concerned with the founding of the Society and his tenure as the first Director; a number of books donated by Colebrooke; and some drawings of Indian agricultural implements, fishing nets, drinking vessels and containers, and musical instruments, also donated by him. We also hold some of Colebrooke’s Personal Papers. Among these is an Autograph book compiled by an unknown individual, but belonging to Frederick Hendricks in 1893. This is a red calf bound book, containing printed and handwritten material including biographical material concerning Colebrooke, obituary notices for Horace Hayman Wilson, and correspondence from Colebrooke to Nathaniel Wallich. Wallich was Superintendent of the Botanical Gardens, Calcutta, and the correspondence concerns the sending of seeds, plants and geological specimens to both England and South Africa, and the sending of books and journals to India. 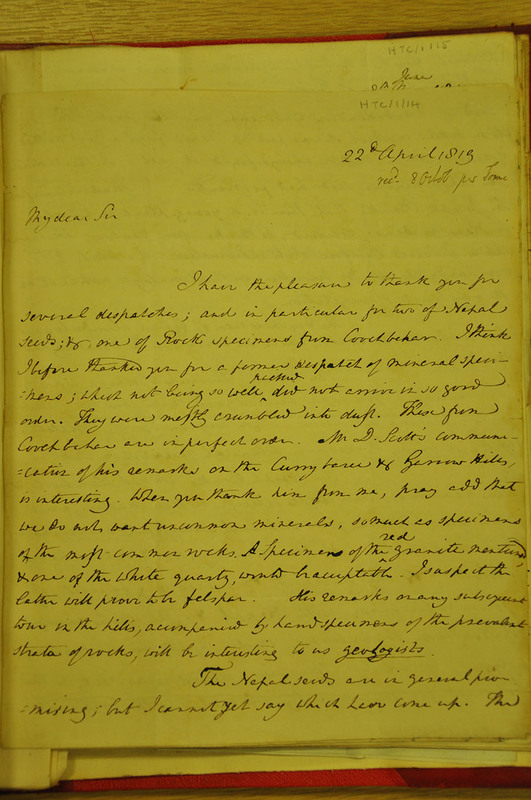 These letters highlight some of Colebrooke’s research concerns at this time. The Personal Papers also contain photocopies of correspondence between Colebrooke and his niece, Belinda Sutherland Colebrooke. She was born on 11th July 1800, the elder daughter of George Colebrooke, Henry’s brother. After his death, her mother became involved in a series of relationships. Belinda and her sister, Harriet, were eventually made wards-of-court and placed with a foster mother. On 28th October 1823 she married Charles Joshua Smith, 2nd Baronet. She died on 22nd January 1825. These letters provide a fascinating insight into the relationship between Henry and Belinda and in so doing provide information on foster care, politics, culture and life in early 19th century Britain. The catalogue of Colebrooke’s Papers can be found online here, hosted by Archives Hub.